With Trump In Office, Did The Kremlin Get More Than It Bargained For? : Parallels The Kremlin never hid its preference for Donald Trump and celebrated his election victory. But there seem to be mixed feelings in Moscow at what has happened since Trump took office. With Trump In Office, Did The Kremlin Get More Than It Bargained For? Russian President Vladimir Putin chairs a meeting of top executives of the Defense Ministry and military-industrial complex in the Black Sea resort of Sochi, Russia, Friday, May 19, 2017. When Donald Trump was running for president, the Kremlin didn't make a secret that it preferred him to Hillary Clinton. The thinking in Moscow was that Clinton would follow President Obama in trying to diminish Russia's role in the world. Trump, on the other hand, promised not only to be friendlier to Russia, but to turn established U.S. foreign policy on its head. Now it might seem that Russian President Vladimir Putin's wildest dreams have come true: Trump is in the White House, and the United States is too distracted by internal divisions to throw its weight around internationally. But while schadenfreude at America's domestic chaos is the prevailing sentiment in Moscow, there's a growing worry that the Kremlin might be getting more than it bargained for. On Wednesday, Putin reacted to reports that Trump had revealed highly classified material to Russian Foreign Minister Sergei Lavrov. "Initially when we watched the first developments in this internal political struggle, we were amused," Putin said. "But now the spectacle is becoming quite simply sad, and it is causing us concern." Putin was so concerned that he even offered to provide Congress with the Kremlin's record of Trump's meeting with Lavrov in the White House earlier this month. Individual reports about the Kremlin's role in U.S. politics don't reach a wide audience in Russia, says Nikolai Petrov, a political scientist at the Higher School of Economics in Moscow. But taken as a whole, they project an image of Russia's newfound power. "The more scandals and rumors connected to Russia, the better it is for Putin to demonstrate how important he is – and how important the country has become under his leadership," said Petrov. Vladimir Frolov, a Russian foreign policy analyst, says Putin's offer to "help" Trump by providing a record of the Lavrov meeting was directed at a domestic audience. "It kind of elevates Putin over Trump – makes him an elder statesman, an experienced guy who can criticize the United States for childish behavior," Frolov said. Still, frustration is increasing that there have been no tangible improvements in U.S.-Russian relations in the first four months of the Trump administration. His fans in Moscow don't blame the U.S. president, but hostile media and Democratic politicians. "We from Moscow look at Mr. Trump with a lot of sympathy, but we also regret that he has so many enemies which effectively blocked his policy," said Sergei Markov, a pro-Kremlin political analyst. Even though Lavrov's visit to the Oval Office was a success for the Kremlin, there was hope in Moscow that Trump would quickly meet Putin to jumpstart relations. Foreign affairs analyst Frolov says the Kremlin still thinks it can deal with the U.S. president. "I think they can manage Trump by flattery, by playing up to his weaknesses, by inflating his ego," he said. "They can manage him, manipulate him. He looks like an easy target." 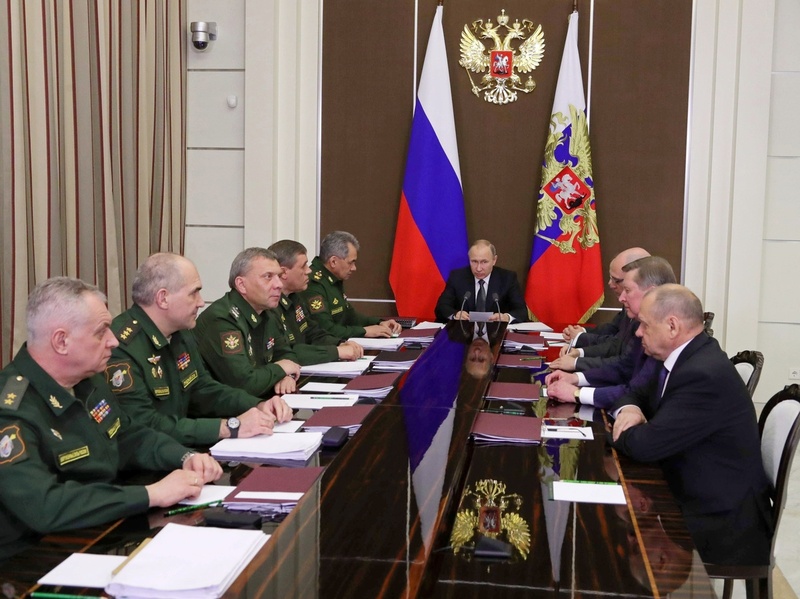 Although Putin expressed anger at Trump's missile strike on Russia's ally Syria in April, such unpredictable decisions are less worrying to the Kremlin than if the United States showed a clear strategy to change the Syrian regime, Frolov says. Yet turmoil in the White House could turn out to be too much of a good thing for the Kremlin. "It's possible to think that Russia can benefit from this chaos," said political scientist Petrov. "But in the longer term, I think that it's not in Russia's interests as well." In the current political climate, it's hard to see Russia and the U.S. reaching an agreement on major issues such as bringing peace to Syria or ending the fighting in eastern Ukraine, a precondition for lifting sanctions on Moscow. It's positive for Russia that the U.S. is preoccupied with domestic politics, says pro-Kremlin analyst Markov. But at the same time, Russia doesn't want to be demonized in what he calls a "new McCarthyism" in the United States. "Chaos on one hand is good because foreign policy is not so active," said Markov. "On the other hand, it's bad for the future because it can create an absolutely unpredictable foreign policy of the United States." A worst-case scenario for the Kremlin would be the tumult in Washington ending with Trump's impeachment – and his replacement by a president openly hostile to Russia. The Kremlin is waiting for a Putin-Trump meeting – as early as July – to set the course. During a visit to China last weekend, Putin played a couple of popular Russian songs on a grand piano while waiting for his hosts. Asked later what he'd play for Trump, Putin scratched his head. "I don't know," he said. "I think I should meet with him first, discuss things, and choose a tune depending on the results."